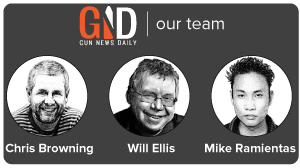 While the AR-15 may be the most popular semi-automatic rifle in the United States, the AK-47 is the most popular in the entire world (and the second most popular in the United States). The AK-47 may not be modular like the AR-15 is, but it’s still equally as if not more recognizable. It also has a reputation for being one of the most reliable semi-automatic rifles on the planet, and for this reason, alone many American shooters will opt for an AK over an AR. Fortunately, both of those questions are going to be answered in this buyer’s guide. First, we’ll talk about the qualities you need to look for in an AK-47 rifle. Then, we’ll talk about the top three best AK-47s for the high priced, mid-priced, and low priced options. 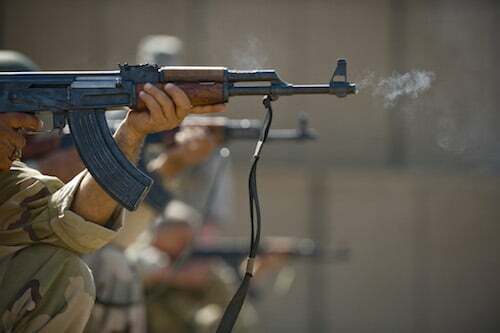 The vast majority of AK-47s are manufactured overseas, and the overall quality of the rifle can be largely dependent on its country of origin. This is because AKs tend to be produced at a higher or lower quality depending on where they come from. For example, generally speaking, AKs produced in China are known for being on the lower end quality speaking. Meanwhile, AK rifles produced in Russia and Bulgaria have a reputation for being some of the very finest that the market has to offer. 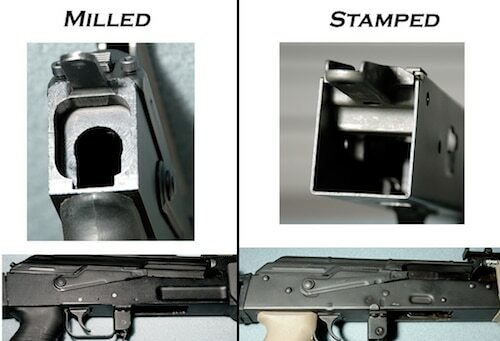 When you buy an AK-47 or AKM rifle, you will have to choose between a milled or a stamped receiver model. 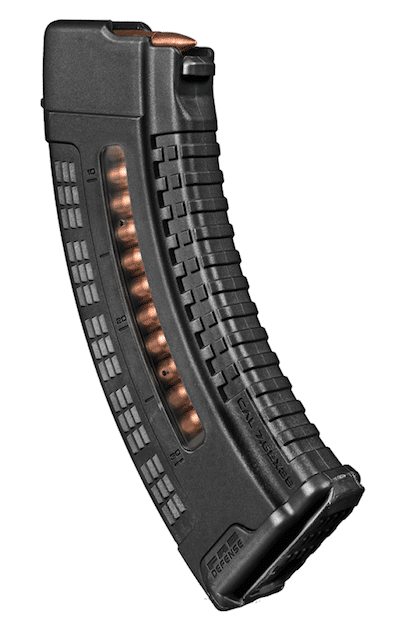 An AK with a milled receiver means that the receiver is machined by the manufacturer from a solid piece of steel. Milled receivers AK’s will lack rivets and be significantly heavier in contrast to stamped receiver models. Stamped receiver AK’s, on the other hand, are more common these days. They’re also easier to build. Basically, a stamped receiver means that the receiver has been ‘stamped’ from a thin piece of metal and then bent into a box shape to create the receiver, before being riveted together. As a result, stamped receivers will have rivets, which makes them easy to differentiate from milled receiver models. Stamped receiver AK’s are lighter as well as cheaper and easier to make than their milled receiver counterparts. But which is better? 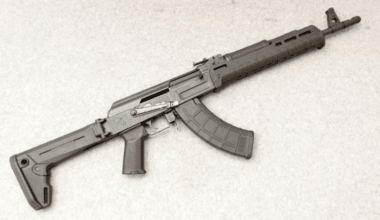 While both work, a stamped receiver AK is generally regarded as being the superior weapon. This is because the AK was originally designed to be produced with a stamped receiver, to begin with. Milled receivers are sturdier and more durable, but they also cost much more and are heavier as was noted previously. For your first AK rifle, a stamped receiver model will work best and save you money. The next thing to look for in an AK is the overall fit and function and quality of the action. This will help determine how reliably your AK runs and how effective it is. To ensure that the gas block of your rifle is aligned properly and that the action is in good shape, grab the bolt handle and then slide it back. Wait until you feel a pressure increase from the recoil spring, and then slowly return the bolt handle to the original position. As you do this, take note of whether the handle slides smoothly or roughly. If it’s rough as it slides back and forth within the bolt carrier, it’s a negative sign. You can also cycle the bolt handle rapidly a few times to check to see if the actions ever get hung up or impeded in any way. If it doesn’t, it’s a good sign that the rifle is in good shape. On the other hand, if the action does get hung up at any point, it’s a sign that at some point the rifle will quit cycling. Yes, you should feel pressure from the recoil spring. But you shouldn’t feel any resistance or impediments as you draw back and release the bolt handle. If at any point the bolt gets locked up, the rifle is definitely not worth your money. Something else you can do to check on the quality of the action will be to remove the top cover of the AK and inspect the hammer. Specifically, you want to confirm that the hammer is not wearing unevenly. There should be smooth wear marks on the face of the hammer. Many budget AK’s especially will have an improperly aligned or canted front sight. This can greatly affect your accuracy when shooting the rifle. The accuracy of the AK platform in general often receives knocks in comparison to the AR-style of rifle. This is why having a properly aligned front sight will be so important to ensuring that your AK is platform enough for your needs. Shoulder the rifle and line up the sights to confirm that the front sight is not canted in any way. You want the front sight to be aligned with the receiver properly in order to get a truly accurate rifle. 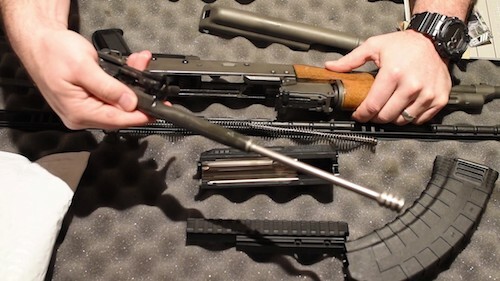 Last but not least, insert a variety of different magazines into the rifle and check to see if there is any resistance at all when inserting them (of course, make sure that the magazines are unloaded and that you have the permission of whoever is selling you the rifle). The magazines should fit very easily into the rifle with no resistance whatsoever, but you also want to make sure that they aren’t loose. Shake the rifle around, and if there’s any rattling caused by the magazine and the magazine well, that’s a problem. The Arsenal SLR and SAM series of rifles are made in and imported from Bulgaria and are routinely regarded as being some of the finest AK’s in production today. That being said, these rifles also command a premium price and regularly cost between $1,000 to $1,500. The difference between the SLR and the SAM versions is that the SLR versions is stamped whereas the SAM is milled. The SAM series is also the most expensive choice and will cost you around $300 to $500 more than the SLR versions. If you want to buy an Arsenal AK at the cheapest price point, you may want to go with the SLR107. This is an excellent AK rifle that can be had for around a thousand dollars. There’s also the SLR107R, which has a fixed stock. 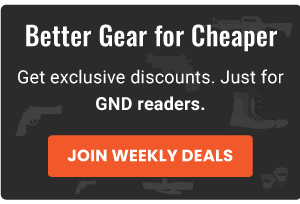 If you don’t have a thousand dollars to spend on an AK, but if you also don’t want to buy the cheapest AK rifles on the market, then you should look at a mid-priced option such as the Century Arms C39V2. The C39V2 will cost you around the $750 mark (maybe a little less depending on where you buy it from). These rifles are 100% made in the USA and come with a variety of neat features including optic side mounts and Magpul MOE furniture (though there are also C39 V2s made with classic wood furniture as well). If money is really tight and you have to go on a serious budget, then you’ll be hard-pressed to ignore the Romanian made WASR-10. This is one of the most widely available AK rifles produced and is most well known for being one of the cheapest options available as well (a WASR 10 rifle should cost you around $500 or so). That being said, quality control on the WASR-10 rifles is not exactly the greatest, which is why you want to carefully inspect your rifle (based on the guidelines we outlined and discussed above) before you move ahead with a purchase. For instance, it’s not uncommon for WASR-10 rifles to have slightly or wildly uncanted front sights, so that’s something that you will need to take into consideration. That being said, one thing that the WASR-10 does have going for it is reliability and durability. These rifles regularly have tens of thousands of rounds sent through them without any issues or signs of serious wear whatsoever, so you’re definitely getting a reliable gun for the money. Your goal then should be to buy the best AK you can for the money that you can afford to spend, and the specific makes and models in the above price ranges should work for you so long as you inspect the rifles to confirm they are in good condition. Your nuts milled receiver AKs blow stamped receivers out of the water when it comes to quality. Yes they are slightly heavier, but if your a grown man who weighs more then 100 pounds your good considering children have used milled receiver AKs effectively in combat. I’ll trade a couple extra pounds for several lifetimes of flawless operation, smoother action and improved accuracy due to the lack of flex from the 7.62×39. My Sam7sf is the finest AK I have ever handled and I have handled them all and own several Russian and Bulgarian rifles. I will say I like the SGL-31 (Ishmaz Saiga) best for 5.45×39, but weight is more important to me when using a cartridge that size.